From Han Solo to Boba Fett, you can create these ten adorable Star Wars figures from a galaxy far, far away! The 48-page instruction book has step-by-step directions and color photos to help you advance from padawan crafter to Jedi felt master. 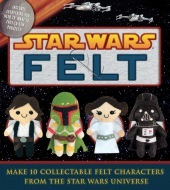 The kit includes everything you need to make all ten characters, including multiple colors of felt, stuffing, a needle, embroidery floss, and die-cut templates. May the felt be with you!